The numbers of children diagnosed with inflammatory bowel disease (IBD) – long-term, painful, and debilitating bowel conditions – has increased alarmingly since 2000, but NCRC-funded research has defied a new target that may be used to control the inflammation. IBD is a group of chronic disorders that cause pain, swelling and inflammation of the small and large intestine. The two most common of these disorders are Crohn’s disease and Ulcerative Colitis. When they occur in childhood these diseases can be particularly devastating, as childhood is a time of growth, when good nutrition is essential. Doctors who diagnose and treat children with IBD – people like Dr. Séamus Hussey, a consultant paediatric gastroenterologist, at the National Gastroenterology Centre based at OLCHC – have been alarmed at a tripling in paediatric IBD in recent years. Dr. Hussey – faced with such a relentless increase in IBD – felt compelled to find out why this occurs in children in the first place, why it is increasing, and possible new therapies. This led to the establishment of research collaboration with Dr. Patrick Walsh, an NCRC Principal Investigator in immunology, and a winner of the President of Ireland Young Researcher of the Year Award (2011). 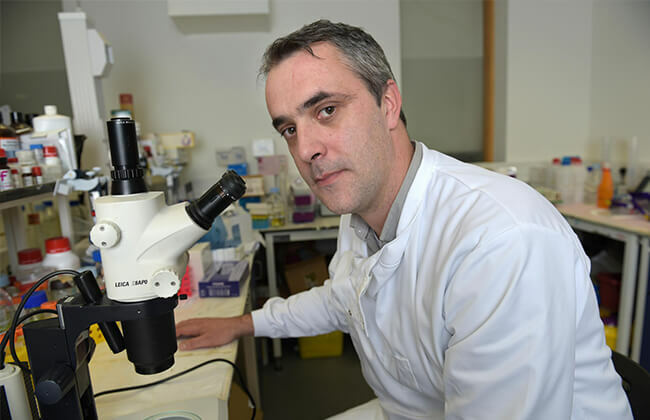 The research has the benefit of access to tiny tissue samples of the bowel of children diagnosed with IBD who were undergoing biopsy sampling as part of their diagnosis and treatment at the Gastroenterology Centre at OLCHC. These tiny samples provide scientific information right at the source of the disease, and at the time of diagnosis. The team compared tissue from children with Ulcerative Colitis or Crohn’s disease to normal tissue. What jumped out was that a small protein- called IL-36 – something known to have a role in skin inflammation – showed up in high levels in the tissue from children diagnosed with Ulcerative Colitis. The finding is important because it was the first time that this inflammatory protein was linked to IBD. This crucial finding opens up the possibility of new therapies to control or reduce the production of IL-36, and therefore the inflammation of the bowel seen in Ulcerative Colitis. As well as shedding, new light on what is causing the disease, this potential new ‘target’ for the pharmaceutical industry may lead to new drug development. Though the IL-36 finding is an important new discovery, and could lead such drugs, the disease is a complex one and further research from this group is needed to fully exploit this information in developing new approaches to the disease.